There is one question that has been plaguing physicists and cosmologists for decades: Why is there so much stuff in the universe. Or more precisely, why is there so much stuff as we know it (or in short, why is there more matter than antimatter)? Ultimately, this question cuts to the heart of our own existence, and some scientists think that the Higgs may hold the answer. Figuring out why matter won out against antimatter takes us back in time, all the way back to the big bang. Shortly after our universe sprang into being, once the cosmos had cooled enough for matter to form, there was an epic battle taking place, a battle that would ultimately determine the fate of our very existence. 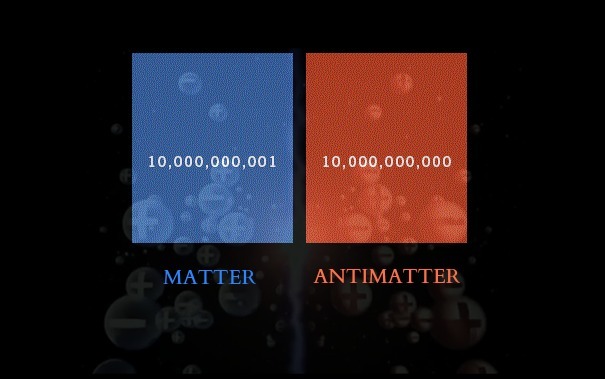 It was the war between matter and antimatter. Most of the matter that popped into existence collided with antimatter particles, and these pairs annihilated one another. But there was something that tipped the balance ever so slightly, and fortunately for us, it tipped the balance in favor of matter. It’s because of this slight imbalance that you and I – that and all the stars, planets, and galaxies in our universe – it’s because of this that we exist. Consequently, Figuring out what it was that upset the balance is key to understanding the life of (and in) our universe. And as previously mentioned, some scientists think that the recently discovered Higgs boson might shed some light on this issue. Scientists at the Department of Energy’s SLAC National Accelerator Laboratory have laid out a possible method for determining if the Higgs boson is involved in this (if and how it is directly connected to the issues of mass and matter in the cosmos). In order to understand how this works, you need to understand something about symmetry in our universe. Charge Parity symmetry. CP-symmetry states that the laws of physics should be the same if a particle is interchanged with its antiparticle. It was a pretty well established idea. But things changed in 1964 with the discovery of CP-violation, which shows that nature treats some opposing particles differently. Yes, our universe seems to be biased. But we don’t know exactly why. And this is where the Higgs comes in. It may be the culprit. First, researchers need to confirm that the Higgs fits into the Standard Model, our current best explanation of matter, energy and the processes that turned them into us. A Higgs that fits the Standard Model where CP violation is concerned is called CP-even; one that does not is called CP-odd. A tell-tale sign that the Higgs is involved in CP violation is if it’s a mixture of even and odd. The theorists proposed that experimenters look for a process in which a Higgs decays into two tau particles, which are like supersized cousins of electrons, while the remainder of the energy from the original proton-proton collision sprays outward in two jets. Any mix of CP-even and CP-odd in the Higgs is revealed by the angle between the two jets. “This is a very high-profile and involved analysis,” said Philip Harris, a staff physicist at CERN and co-author of the paper along with Martin Jankowiak of the University of Heidelberg and Michael Spannowsky of Durham University. A member of the CMS collaboration, Harris focuses on Higgs-to-tau-tau decays, evidence of which has only recently begun to mount. “I wanted to add a CP violation measurement to our analysis, and what Matt, Martin and Michael proposed is the most viable avenue. 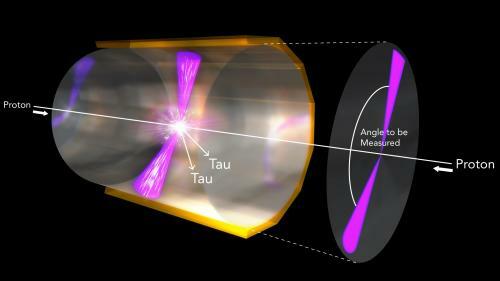 Even with just a few months of data we can start to make real statements about the Higgs and CP violation,” Harris said. If the experiment sounds a bit technical, it may help to read this: Brief Guide to Particle Physics.